Sir Thomas Wyatt* was a pioneer in bringing to English poetry the new forms of the Italian Renaissance, especially the Petrarchan* sonnet. Of forced sighs and trusty fearfulness. Wreathed with error and eke with ignorance. A translation of Petrarch's original*. Shakespeare's sonnets are discussed in the section on his life. Selected works by Wyatt (Luminarium). Selected works by Wyatt (Representative Poetry, Toronto). 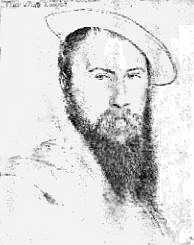 Wyatt (1503-1542), travelled in Italy, where he found models for much of his poetry. He spent a period in the Tower because of an alleged involvement with Anne Boleyn. One of the great voices of the early Renaissance, Francesco Petrarch (1304-74) created the great sequence of sonnets to his courtly love, Laura. By the time Shakespeare was writing, the freshness and originality of many of Petrarch's images had become clichés worthy of ironical treatment, notably in his sonnets to the Dark Woman. My two usual sweet stars are hidden; dead among the waves are reason and skill; so that I begin to despair of the port. Set by his contemporary, William Cornyshe, Wyatt's lyric has been set as a "catch," or round. The poem is a debate between two common--and interconnected-- views of women. Click for more on the battle of the sexes. And thou shalt know of mine. My lady is unkind I wis! Alack why is she so! And yet she will say no. She will change for no new. And turneth with the wind.